For week 18 I'm taking a "close up" look at one of my ancestors. I've taken my cue from the calendar and chosen one born on 4th May. This is Lourens Gerritszn Wit, born 4 May 1738, Midden Beemster, Noord Holland, The Netherlands. I begin by looking at my family tree site and checking where I've got that detail from. 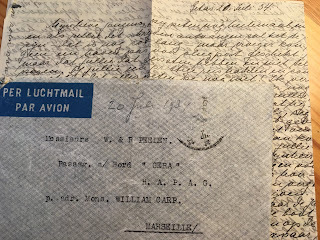 I've traced it to my uncle's genealogy files and online tree and find it in his correspondence with a distant cousin Bob Bronke, dated 29 November 2004. But... it is a handwritten pedigree, no birth record source. OK, no problem, I'll check in with Open Archieven my favourite first stop for finding records, should just be there waiting for me. Ha, so nothing comes up for the name Lourens Gerritzn Wit. After some searching I finally find a marriage record for his son Gerrit Wit and now I understand why I couldn't find Lourens. As the father of the bridegroom he is called Louwus! The marriage record doesn't give his birth date so I keep searching with the name Louwus Wit but nothing more comes up. Conclusion? Look somewhere else. I look up the archives for his birth place, Midden Beemster, and start searching in Waterlands Archief and that's where I find his christening record and that has the date of 4th May 1738, so his actual birth date could have been any time within five weeks before. Now his name is Louris! His father's name is Gert Wit and his mother is Aafje Louris, and the location as Middel Beemster. What's in a name, indeed. From the same family archive source I have his date of death as 31 October 1806, Beemster. I repeat the same process but can only find in Waterlands Archief his burial date, which is 3 November 1806. The date of death is consistent with the practice of burial taking place within 3 days, but I still haven't found the record. By now I am thoroughly confused over all his different names, none of which match the "official" name given in the handwritten pedigree I started from. His wife is almost as bad with her name. 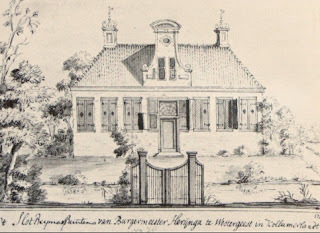 I've got a marriage date of 2 March 1781 for Jannetje Cornelisdr Kroon and when I find the marriage record in the registers of Waterlands Archief another variation of her name pops up - Jantje Cornelis Croon. I should focus however on Lourens Wit, and I think I can be quite sure of the BMD facts, so I try to find out more about him. He married Jantje or Jannetje Kroon/Croon quite late in life, at the age of 43, and she was only 19. Was there a previous wife, who died, other children I don't know about? What did he do for a living? He was most probably a farmer with a small holding of cattle. On the other hand he might have been a chirurgijn or country doctor like his son Gerrit Lourenszn Wit. I haven't found any records to indicate this so I'm just guessing. He lived in the Beemster, an area of reclaimed land, a polder, just north of Amsterdam. It was created in 1612 by draining Lake Beemster. It was the first large land reclamation project covering an area of 7208 hectares and to this day has retained its regular geometric lay-out of fields, canals, roads, dykes and settlements. It is now World Heritage listed - click on the link for a short video about the area -https://whc.unesco.org/en/list/899/video. Lourens and Jannetje had three children; two girls, Aafje and Jantje and a son Gerrit and Gerrit's daughter Aafje is my great-great grandmother.